Summer is just around the corner (at least here in Northern California!). 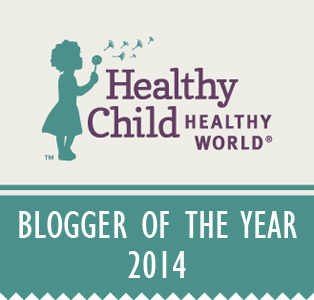 It's time for me to sign up my three little ones for swim lessons and to get out the beach and swim gear. This is the time of year when I make sure we are well-stocked with non-toxic, broad spectrum sunscreens so that I'm not stuck with an old expired sorta icky tube of sunscreen the first day of swim lessons or the first time we head for the beach. This summer we will be using Goddess Garden Organics sunscreens. 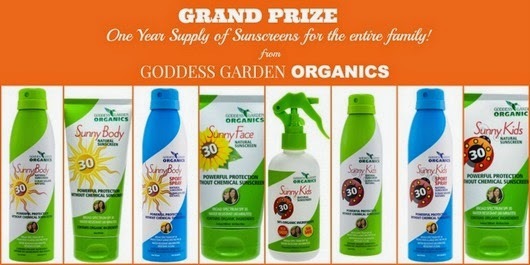 Goddess Garden sunscreens are safe, effective, convenient to use (non-toxic sunscreen spray, anyone? ), and non-whitening. Here is a surprising truth: there is no proof that sunscreens prevent most skin cancers. Researchers offer several explanations for this counter-intuitive finding: one is that people who use sunscreens spend more time in the sun than those who don't (ultimately exposing themselves to more UV rays than the non-sunscreen users who stay out of the sun); there is also evidence to suggest that some ingredients commonly used in sunscreens (such as vitamin A/ retinyl palmitate) may actually speed the development of skin cancer; finally, another possible explanation is that many sunscreens protect users only against sunburns from UVB rays without protecting users from UVA rays, which are linked to skin cancer and premature aging. Always limit your time in the sun, especially when the sun is most intense (10 am to 2 pm). Do not be lulled into thinking you can spend as long as you want in the sun just because you are wearing sunscreen and/or not yet sunburned. Cover up with hats, long sleeves, and long pants whenever possible. 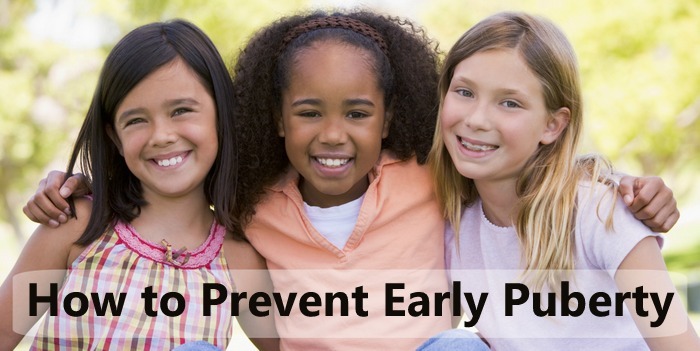 Take special precautions to keep children from sunburning, as childhood sunburns have a strong correlation with elevated risk of melanoma cancer. Use a sunscreen with strong UVA protection (UVA rays are linked to skin cancer and aging). Mineral sunscreens, such as zinc oxide and titanium oxide, offer broad spectrum protection: they block both UVA and UVB rays. 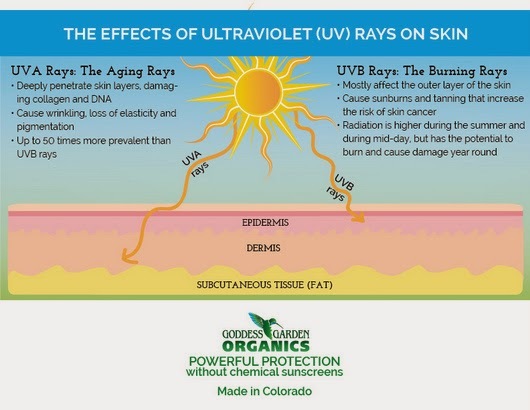 Most chemical sunscreens offer little protection from UVA rays (see figure below). Goddess Garden Organics products use only mineral sunscreens, which create a physical barrier between your skin and the sun's rays. In fact, Goddess Garden products reflect 97% of the sun’s harmful UV rays. In addition, natural mineral sunscreens are effective immediately, meaning that you don't have to apply them 30 minutes before you go out into the sun as with chemical sunscreens, which is awesome since I never in my life have put sunscreen on my kids until they were already in the sun. In addition to choosing a sunscreen with an effective mineral sunscreen as the active ingredient, it's important to select a sunscreen without harmful inactive ingredients. 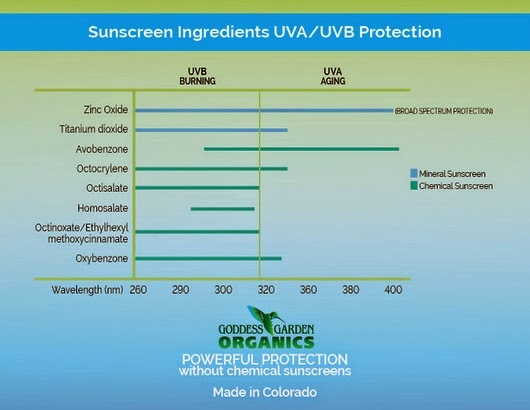 Goddess Garden sunscreens are free of Vitamin A, fragrance, hormone disrupting chemicals, liquid plastics, and alcohols. Instead of synthetic chemicals, Goddess Garden products are loaded with non-toxic, skin-nourishing, non-GMO, certified organic ingredients including aloe vera, shea butter, and lavender. 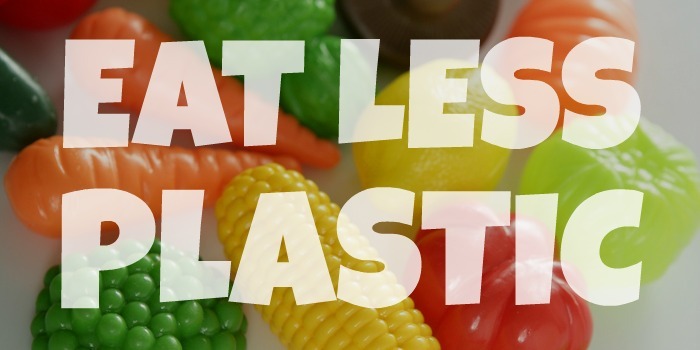 In addition, they are biodegradable and reef-safe. I have shied away from sunscreen sprays in the past for several reasons: none of them used the safer, more effective mineral sunscreens; they were loaded with potentially hazardous ingredients like parabens and phthalates; there is the added danger that you will inhale these toxic ingredients via the tiny particles that remain suspended in the air after spraying; and they used aerosols, which contribute to air pollution. 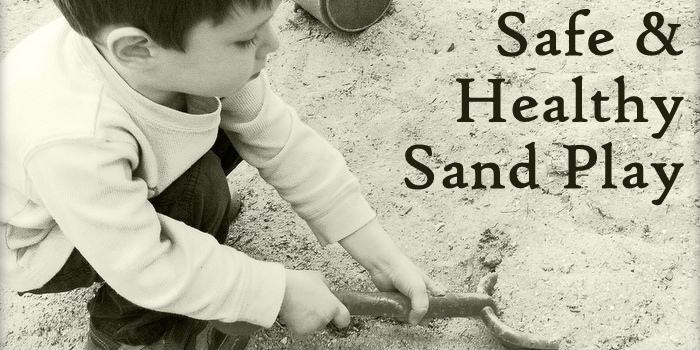 But I will admit that there have been times I have watched a bit jealously as my sister or friend re-applied sunscreen to an impatient or squirmy child in just moments using a spray while I laboriously slathered lotion over limbs and faces. I especially dislike trying to reapply sunscreen lotion from a tube on sandy legs and feet, which always happens when we are at the beach. So I was thrilled when I saw that Goddess Garden makes a safe continuous sunscreen spray without any aerosols. Their Kids Natural Sunscreen Continuous Sport Spray is SPF 30 and water resistant for 80 minutes! They also make a spray that is not continuous (more like a standard spray bottle). I think both work well and both are far easier to use to cover large areas than lotion from a tube. The continuous spray covers a larger area at once with a slightly finer mist. Of course when using sprays you need to remember to take a few extra precautions to avoid inhalation: do not spray directly on faces, use in a well-ventilated area, and do not use under windy conditions. You'll find these important reminders right on Goddess Garden's bottles. Although you can spray it into your hands and then apply to your face, I prefer to apply lotion from a tube to my family's faces. For all those arms and legs anxious to jump back into the pool or get back to building sand castles, I'll be using the spray. Keep in mind that because the mineral sunscreens are non-nano, they are airborne only momentarily because of the weight of the zinc and titanium particles. Having smelled (and inevitably inhaled) chemical sunscreen from someone spraying their kids 100 feet upwind from me on the beach, I can tell you that these non-toxic sprays are very different and far less likely to be inadvertently inhaled. 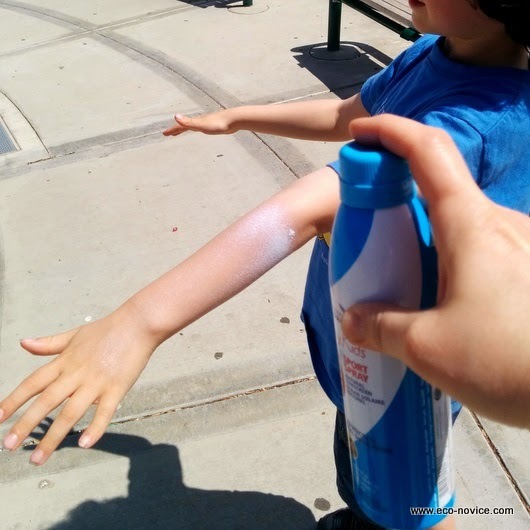 Sunscreen spray creates a fine mist of white that easily rubs in. One short push of the pump covers an entire arm. As parents, we are responsible for our children's sun protection. Childhood sun protection is particularly significant given that we now know that "there is a strong correlation between melanoma risk and the number of sunburns someone has had, particularly in childhood" (source). In addition to choosing a broad spectrum sunscreen free of harmful ingredients, I think it is important to consider convenience. 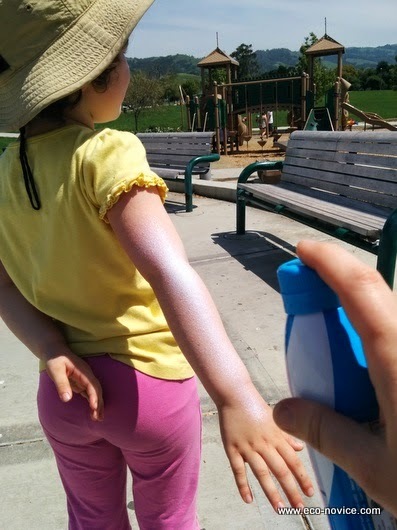 I think most parents would admit that they apply sunscreen to their children on fewer occasions and less often than they know they should because applying sunscreen (especially with an uncooperative child) can be a big hassle. This is why I consider Goddess Garden's Kids Continuous Spray Sunscreens some of the best sunscreens for kids on the market. 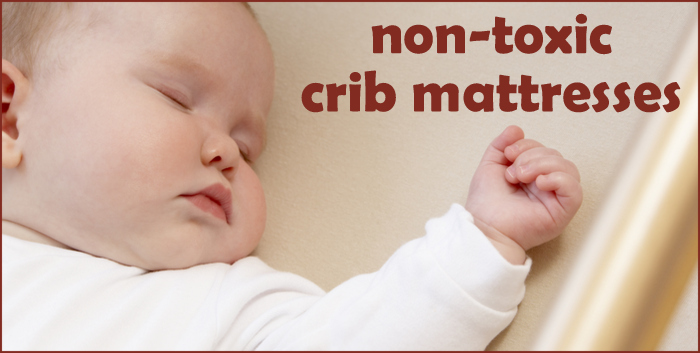 They are safe, effective, and convenient. Now is the perfect time to stock up since Goddess Garden is offering $2 off with the code #GGOrganics now through July 30, 2014. Click here to go to their website. Good thing this sunscreen is effective immediately because she's ready to play now! 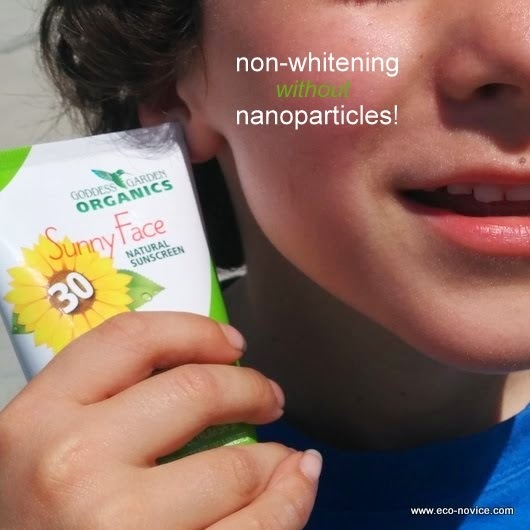 If you have been using mineral sunscreens free of nanoparticles (generally considered to be particles smaller than 100nm) for several years, you know that they can make you look, well, a little ghostly. In fact, true story, my son was a ghost for Halloween last year and I didn't plan far enough in advance to purchase any non-toxic face make-up, so I thickly applied our leftover natural sunscreen to make his face look ghostly white. Worked like a charm. However, most folks aren't thrilled about looking pale and sickly at the beach or poolside. The good news is that Goddess Garden Organics has figured out how to make a mineral sunscreen without nanoparticles that are sheer and transparent, and not at all pasty (they spread on easily like a regular lotion). The zinc and titanium sunscreens used in both the lotions and sprays are exactly the same and have an average particle size of 120nm (the range in particle sizes is 100nm to 130nm). One of my favorite sunny faces. Are you ready for summer? Perhaps you need some non-toxic sunscreen for your family? I have great news! An additional 20 people will receive a travel size 3.4-ounce tube of Natural Body sunscreen, perfect for purse or carry-on luggage. And if you aren't one of the 21 lucky duckies remember to take advantage of Goddess Garden's current offer for $2 off with the code #GGOrganics now through July 30, 2014. 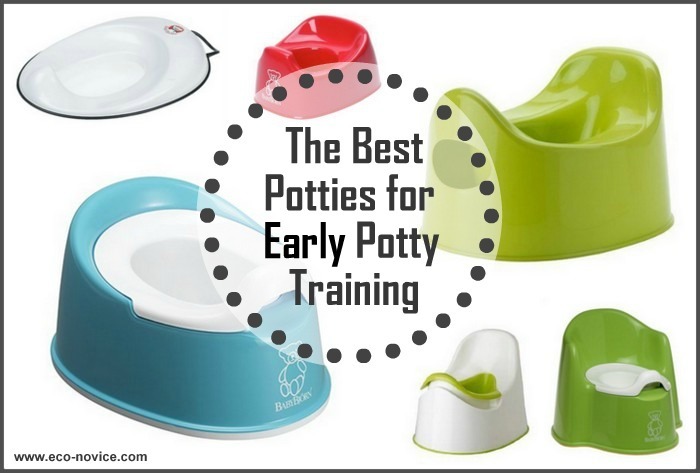 Click here to go to their online store. Good luck!